2. Post it on your blog saying who gave it to you. 3. 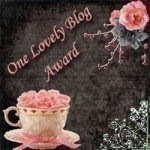 Pass it on to other new blogs you think are wonderful. Lucy from Attic24 She has some truly beautiful crochet artwork. Alessandra from Just be Happy Some more amazing crochet artwork. Go ahead and check out these fantastic blogs. Awww thanks you so much for the award, i truly appreciate it. You made me feel very special, thank you so much for the award! I'll blog about it on my next post.